The Pennsylvania Lodge of Research is a unique occurrence in the history of the Grand Lodge of Pennsylvania, as this is the first Lodge constituted within our Jurisdiction solely for the purpose of Masonic study. The Pennsylvania Lodge of Research holds only two Stated Meetings each year, with Special Meetings to be held at the discretion of the Worshipful Master. Meetings are held at various Masonic sites throughout the Commonwealth. No Craft Degrees are conferred. 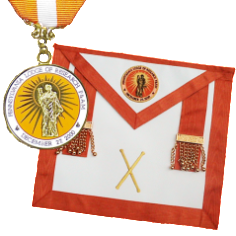 The elected Worshipful Master does not receive “the Word of the Chair,” nor does he become a voting member of the Grand Lodge. 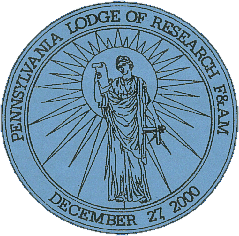 The medallion of the Pennsylvania Lodge of Research depicts a classical female allegorical figure holding a manuscript in one hand and a square and compasses in the other. The sunburst represents Enlightenment. Its symbolism is obvious in depicting the purposes of the Lodge of Research as sharing Masonic Light with others who are following a planned approach to personal character-building and self improvement, and to encourage an organized process of formal education of the Craft at large.